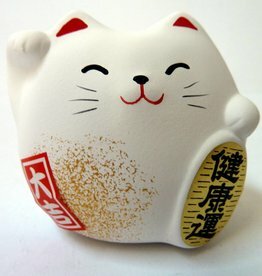 The significance of the Maneki Neko lucky cat or is "beckoning cat". The color of the kitten has a positive meaning, such as financial happiness (gold), happiness in love / marriage (pink or red), good health (green), purity (white). Kittens are made of high quality ceramics and are from Japan. They are packed in a nice gift box. Give your girlfriend, mother or sister, a Maneki Neko / gelukskat gift as a token of affection. Gift idea: birthday, "successful", cohabitation, marriage. 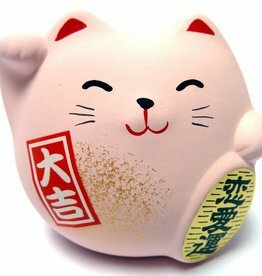 This cute little pink Maneki Neko (Japanese lucky cat), brings you luck in love and your relationship. 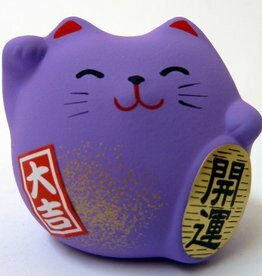 These cute little purple Maneki Neko (Japanese gelukskat) brings you a lot of creative ideas. A white Japanese Maneki Neko, gelukskat brings you purity, positivity, happiness and joy. 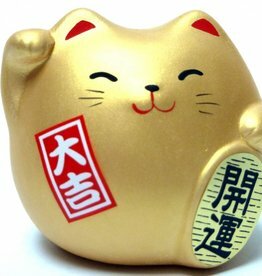 This cute little golden Maneki Neko (Japanese lucky cat) wishes you financial happiness. Please order in our webshop! Fast delivery!